By the end of 2019, at least half of all searches will be voice searches – this includes not only personal queries such as “What’s the weather”, but more business-related questions like “Where is the closest place for me to replace my tire today”. According to market research, 76% of people who search for something nearby on their smartphones visit a related business that day, and 28% of those searches result in a purchase. Smart speakers also add to voice search analysis. Nearly one in five U.S. adults today have access to a smart speaker, according to new research out this week from Voicebot.ai. That means adoption of these voice-powered devices has grown to 47.3 million U.S. adults in two years – or 20 percent of U.S. adult population. This data confirms that smart speakers are being incorporated into everyday lives of consumers: 63% report using them daily and 77% at least weekly. A new survey revealed that 62% of marketers have no specific plans for optimizing their business’s website for voice search – but nearly 20% of all searches today are performed via voice. Another survey by ClickZ and Marin Software reveals that only 7% of marketers prioritized investments in 2017 in “AI” (voice search, digital assistants, and chatbots). Maybe more surprising is that only 4% of marketers name “smart hubs” such as Amazon Echo and Google Home as a top priority for 2017. The key to optimizing your website to hit the top of your potential clients’ search results is to have your site think how people speak. Instead of typing in what you think the most important keywords are, you are now starting a conversation with your search engine (with the possibility of adding some follow-up questions as well). These are known as semantic searches. Semantic searches are longer queries that are conversational in nature, and will need to be parsed by a search engine to understand what the user wants. Semantic searches with natural language processing engines give the search engine a sense of “personality” that the consumer can relate with. Goals need to be defined in a way that relates to users’ problems. Voice searches are significantly more focused on details and are typically questions, where text searches are more blunt statements. You need to fine-tune your website to answer the pain points that your consumers are facing and achieve some form of a language-market fit. Make sure that your website is able to address possible conversations between you and the consumer – prepare for follow up questions if you can and try to address all gaps between content as best as possible. As a business, you need to come up with quick, concise answers to detailed questions. Although major search engines can parse images for more information, it is always a safer bet to place critical details in the actual HTML of your page. Things like addresses and phone numbers should always be explicitly in the schema markup of the page and should not be inferred by the image parser. Smart speakers and personal assistants are expanding well past the current scope of consumers’ personal lives and are reaching more into the business and enterprise worlds. Having your business embrace voice searching early will pave the way for more elegant use cases for voice functionality later on. If you can make your consumers comfortable with your business from a basic search experience, imagine what you can do once they are actually using your business. 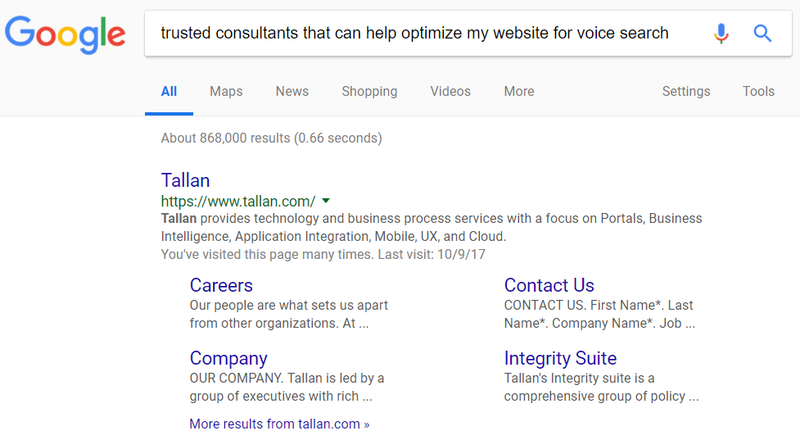 Tallan is no stranger to voice searching and knows from experience that queries go well beyond the standard, day-to-day questions any user would ask their device. We have implemented voice search functionality in a wide range of enterprise level businesses – from the mortgage world to the hospitality business; you would be surprised at just how many searches are done by voice right now. Contact us today to find out how we can help you and your business shine in the search results. Well written piece. Thank u! Great use of statistics to show the importance of businesses adapting to advancing technology. I also agree that companies need to define their goals in a way that relates to users’ problems. Very well written, thank you for the insight!